Very interesting stuff Lloyd. Ive often wondered what the surface of the gas giants would look like. I am also starting to question the gas giant moniker. Could it be that Jupiter (and Saturn for that matter) is a rocky, iron-rich planet after all? * Yeah, apparently Thornhill considers them all to be rocky. Rather than upwelling clouds of warm gas, the spot is probably rotating because external electromagnetic fields are influencing the atmosphere. The Great Red Spot, as well as other rotating vortices on Jupiter, could be where Birkeland currents impinge on the giant gas planet. * I suppose they're suggesting that Jupiter, like the Sun, is receiving electrical input from galactic currents, though on a smaller scale. I also suppose they mean to suggest that it gets its color from transmutation of sulfur, or from excitation of oxygen in its atmosphere. And I suppose it may mean that there is no mountain stirring up the vortex, or that the external electric currents are attracted to the mountain, if there is one. * Does anyone have info or clues on all this speculation? Here's my 2p of speculation (admittedly not "Science!"). I am not a full adoptee of plasma mythology namely because it seems to me that no matter how likely a conclusion one might paint is, you're just flat never going to know. That said, if there is a mythological identity link of some kind between Victoria and Aphrodite - and I simply can't remember back enough years to recall - then I'd say the Great Red Spot is likely NOT a mountain under all those clouds, but the basin from which Venus was born. Didn't Victoria emerge fully formed from Zeus/Jupiter's forehead? That's what I think it is until further notice. Not fact, not doctrine, but I think at least possible and maybe likely. * Velikovsky did argue that Venus came from Jupiter, but Cardona, Talbott and others considered his argument very weak. They seem to consider the parent of Venus to be more likely Saturn than Jupiter, but they have said there's not enough "historical" evidence to determine whether Venus was actually seen to erupt from Saturn, or whether it appeared from behind Saturn or from behind some other obstructive mass, such as clouds, haze, plasma etc, in Saturn's vicinity, probably within 1 million miles of the Earth at the time. * I've heard someone else suggest in the 70s or 80s that Venus came from Jupiter's Great Red Spot. Since Venus was not originally associated with Jupiter, that's unlikely. Even if it happened, it could have left a mountain, rather than a basin. Anyway, the Spot is now said to be formed from outside electric current forces, instead of forces on Jupiter. I think a mountain would attract such currents more than would a basin. But maybe there's a mountain surrounded by a basin. How would that be? Well drat. Don't get me wrong - I appreciate the info - but I didn't know Velikovsky had the same idea. I knew it couldn't possibly be original with me, but I'm simply not up on my Venus/Jupiter lore. Ok, so for a mountain to be the likely suspect - are we talking monolithic block, or a so-called "rebound" central crater spire / EDM pillar (which provides a basin as well), or what? And has Jupiter's atmosphere ever been sounded (radar or lidar or whatever)? I expect not, but don't know. Anyway, the Spot is now said to be formed from outside electric current forces, instead of forces on Jupiter. I think a mountain would attract such currents more than would a basin. But maybe there's a mountain surrounded by a basin. How would that be? The spot is of course, part of the weather in Jupiter's atmosphere. As follows from the EU this is determined by outside electric currents, that being said, it is not unreasonable to theorize that some deformity (such as a highpoint) in the core could act as the focus of the phenomenon. But maybe there's a mountain surrounded by a basin. How would that be? That could be a description of a large walled plain (or crater) with a central peak? as observed on the Moon and other bodies. Just a thought. This discovery is owe to low instrumental background and large effective area of the X-ray CCD system onboard Suzaku. The diffuse X-ray emission spatially coincides with Jupiter's radiation belts, which host high energy ions and electrons accelerated in a strong Jovian magnetic field. The emission seems to be originated from mega electron volt electrons having a huge velocity near that of the light. Scientists expect that future Suzaku observations of Jupiter will reveal an unknown aspect of Jupiter's radiation belts. What's that glow around Jupiter? Shown in the false-color X-ray image above, Jupiter evidently is surrounded by a diffuse X-ray emitting region. This glow was detected by the Suzaku X-ray telescope thanks to Suzaku's low noise background and high sensitivity to energetic X-rays. Astronomers believe this X-ray emission may be produced by sunlight scattering off high energy electrons. These electrons may be either trapped in Jupiter's radiation belts, or produced in the Io Plasma Torus. Some of these trapped charges might migrate along Jupiter's magnetic field lines and produce beautiful coronae near the Jovian poles - if only there were anyone to see them. Thanks for that StefanR. There are a lot of 'mays, mights and could bes' from the astronomers though. Why don't they consult some electrical engineers instead? Scientists expect that future Suzaku observations of Jupiter will reveal an unknown aspect of Jupiter's radiation belts. The better the imaging of near and distant objects becomes, the more the structures appear to take on the characteristics of electro-magnetic machines. Love it. NASA's Juno spacecraft will be forging ahead into a treacherous environment at Jupiter with more radiation than any other place NASA has ever sent a spacecraft, except the sun. In a specially filtered cleanroom in Denver, where Juno is being assembled, engineers recently added a unique protective shield around its sensitive electronics. New pictures of the assembly were released today. "Juno is basically an armored tank going to Jupiter," said Scott Bolton, Juno's principal investigator, based at Southwest Research Institute in San Antonio. "Without its protective shield, or radiation vault, Juno's brain would get fried on the very first pass near Jupiter." An invisible force field filled with high-energy particles coming off from Jupiter and its moons surrounds the largest planet in our solar system. This magnetic force field, similar to a less powerful one around Earth, shields Jupiter from charged particles flying off the sun. The electrons, protons and ions around Jupiter are energized by the planet's super-fast rotation, sped up to nearly the speed of light. Jupiter's radiation belts are shaped like a huge doughnut around the planet's equatorial region and extend out past the moon Europa, about 650,000 kilometers (400,000 miles) out from the top of Jupiter's clouds. "For the 15 months Juno orbits Jupiter, the spacecraft will have to withstand the equivalent of more than 100 million dental X-rays," said Bill McAlpine, Juno's radiation control manager, based at NASA's Jet Propulsion Laboratory in Pasadena, Calif. "In the same way human beings need to protect their organs during an X-ray exam, we have to protect Juno's brain and heart." The strategy? Give Juno a kind of six-sided lead apron on steroids. With guidance from JPL and the principal investigator, engineers at Lockheed Martin Space Systems designed and built a special radiation vault made of titanium for a centralized electronics hub. While other materials exist that make good radiation blockers, engineers chose titanium because lead is too soft to withstand the vibrations of launch, and some other materials were too difficult to work with. Each titanium wall measures nearly a square meter (nearly 9 square feet) in area, about 1 centimeter (a third of an inch) in thickness, and 18 kilograms (40 pounds) in mass. This titanium box -- about the size of an SUV's trunk – encloses Juno's command and data handling box (the spacecraft's brain), power and data distribution unit (its heart) and about 20 other electronic assemblies. The whole vault weighs about 200 kilograms (500 pounds). The vault is not designed to completely prevent every Jovian electron, ion or proton from hitting the system, but it will dramatically slow down the aging effect radiation has on electronics for the duration of the mission. "The centralized radiation vault is the first of its kind," Bolton said. "We basically designed it from the ground up." When NASA's Galileo spacecraft visited Jupiter from 1995 to 2003, its electronics were shielded by special components designed to be resistant to radiation. Galileo also didn't need to survive the harshest radiation regions, where Juno will operate. But Juno isn't relying solely on the radiation vault. Scientists designed a path that takes Juno around Jupiter's poles, spending as little time as possible in the sizzling radiation belts around Jupiter's equator. Engineers also used designs for electronics already approved for the Martian radiation environment, which is harsher than Earth's, though not as harsh as Jupiter's. Parts of the electronics were made from tantalum, or tungsten, another radiation-resistant metal. Some assemblies also have their own mini-vaults for protection. Packing the assemblies next to each other allows them to shield their neighbors. In addition, engineers wrapped copper and stainless steel braids like chain mail around wires connecting the electronics to other parts of the spacecraft. JPL tested pieces of the vault in a radiation environment similar to Jupiter's to make sure the design will be able to handle the stress of space flight and the Jupiter environment, McAlpine said. In a special lead-lined testing tub there, they battered pieces of the spacecraft with gamma rays from radioactive cobalt pellets and analyzed the results for Juno's expedition. The vault was lifted onto Juno's propulsion module on May 19 at Lockheed Martin's high-bay cleanroom. It will undergo further testing once the whole spacecraft is put together. The assembly and testing process, which also includes installing solar panels for the first-ever solar-powered mission to Jupiter, is expected to last through next spring. Juno is expected to launch in August 2011. "The Juno assembly is proceeding well," said Tim Gasparrini, Lockheed Martin program manager. "We have a number of the flight and test unit spacecraft avionics components installed into the radiation vault for system testing and we have also just installed the first instrument, the microwave radiometer." JPL manages the Juno mission for the principal investigator, Scott Bolton, of Southwest Research Institute at San Antonio, Texas. Lockheed Martin Space Systems, Denver, Colo., is building the spacecraft. The Italian Space Agency in Rome is contributing an infrared spectrometer instrument and a portion of the radio science experiment. Juno will improve our understanding of our solar system’s beginnings by revealing the origin and evolution of Jupiter. o Explore and study Jupiter’s magnetosphere near the planet’s poles, especially the auroras – Jupiter’s northern and southern lights – providing new insights about how the planet’s enormous magnetic force field affects its atmosphere. For what it's worth. Doesn't mean there's necessarily a solid mountain under there, but interesting speculation anyways. Hopefully, spacecraft Juno (eta Aug 2016) will obtain a lot more information on the area (viewtopic.php?f=4&t=477&start=45#p37983). Although most attention was focused on the menagerie of moons, turbulent Jupiter also came under scrutiny. Images of the Great Red Spot showed considerable internal structure and a "top hat" shape in which the central region rose 3 - 7 km (2 - 4 miles) above the dense, surrounding clouds. Numerous thunderheads up to 50 km (30 miles) tall were identified just north of the Spot. Galileo's near-infrared spectrometer was also able to detect dry, hot spots where the deeper atmosphere was visible through localised thinning of the main cloud deck. 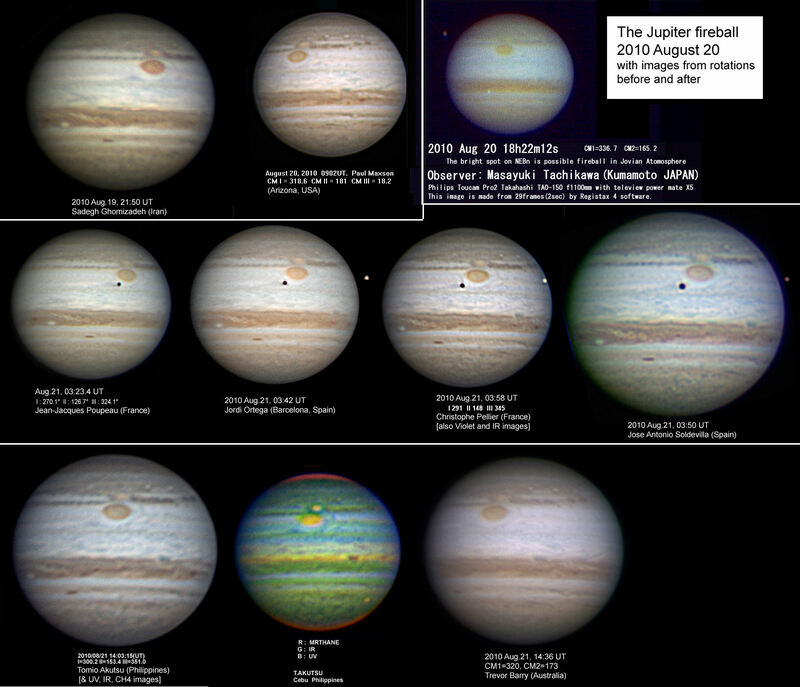 "Like the event of June 3rd, this fireball did not produce any visible debris," notes John Rogers, director of the British Astronomical Association's Jupiter section. "Here are some hi-resolution images taken 1-2 rotations before and 1-2 rotations after the event. As the observers commented, there was no visible mark (not in RGB, nor UV, nor methane), post-impact. Dark brown spots on the North Equatorial Belt were already there before the fireball." Was it an "impact"? Did they see what hit the planet? Or is it a Jove spot ?? Jupiter "bruise" - Caused by an Impact? My question is the somewhat obvious one: Are these faint rings real, or are they an artifact of the photographic and/or encoding (jpeg?) process used to make this graphic? I would be tempted to say that the circles are only optical illusions, perhaps akin to a moire pattern, caused by the regularly spaced ripples in the bands of clouds and unconsciously by the roundness of the GRS, combined with the low resolution of the photographs. When you look at a good quality of photo of Jupiter, the concentric rings are not apparent, and if you look at each part of the image that contributes to the apparent rings, they do not in isolation seem to form part of a larger arc. In addition, some of the photos are not too far apart in time but the apparent circles vary quite considerably. You could call it an artefact of the image processing, part in the JPEG and part in the human brain. Having said that, considering that we know so little about the Jovian atmosphere and the fact that something mysterious is making big swirls just for the GRS to exist in the first place, it's not beyond plausibility that very subtle concentric transverse waves could ripple away from focal points like the GRS, perhaps only every now and then, like a pebble hitting a pond. Perhaps it's a Jupiter-quake centred on the GRS. If the circles are real and indicate transverse waves rippling away from the GRS, what would their wavelength tell us?